Lost in the Movies (formerly The Dancing Image): Twin Peaks: The Return Part 4 - "...brings back some memories." Twin Peaks: The Return Part 4 - "...brings back some memories." By now, Twin Peaks: The Return has settled into a groove of telling several stories, each involving familiar characters from the old series and a central hub (Cooper's disappearance). Whether it will stay in this mode or not, this is the most conventional hour so far - if you can call a TV episode conventional when it includes a man transplanted into a lookalike's body who is so unfamiliar with human ways that he drapes a tie across his head like a bonnet and eats pancakes with his fingers, several minutes of a man in the woods spray-painting hanging shovels gold, and a long parodic beatnik monologue from Michael Cera playing a Wild One knockoff who for some reason has taken Marlon Brando's last name rather than his parents'. His parents, as we all suspected, are Andy and Lucy but I don't think anyone predicted the apple would fall this far from the tree (while still remaining just as lovably goofy in a different way). The actors all look like they wanted to burst out laughing, and I sure as hell did. Incredibly silly? Maybe, but it was also one of the funniest things I've ever seen on Twin Peaks. "...brings back some memories," appropriately enough restores several familiar characters and introduces others who are already related to the Twin Peaks fold. Many are less surprising than fulfilling. Bobby Briggs is a deputy, still moved by the portrait of his old girlfriend (Dana Ashbrook's go-for-broke weeping hits that funny/sad/uncomfortable OG Twin Peaks tone better than anything else we've witnessed so far). There's Lucy's and Andy's boy, of course, and Sheriff Frank Truman - Harry's brother. Robert Forster, originally cast as the sheriff in the old series before scheduling conflicts forced him out, finally gets his chance to run the department. Don't count Harry out though, as apparently he's just sick - not retired or (gulp) dead. At least not yet (Michael Ontkean is not supposed to appear, so things don't look good). Denise Bryson is now chief of staff for the FBI (the writers seem to have forgotten she was DEA) and has an odd conversation with Gordon in which she warns her old supervisor not to pursue the young, attractive Tamara Preston (to my surprise she's played by Lynch's musical muse Chrysta Bell rather than Amy Shiels or Naomi Watts, as many suspected). The Denise exchange - in which Gordon reminds her of her pre-transition days and winces at talk of hormones - plus the ogling over Tamara may earn Lynch and Frost disapproval from viewers hoping for more progressive social mores in the world of Twin Peaks. It is worth noting that The Return marks a major departure from the majority of Lynch's work during the twenty-first century (shorts, features, even commercials): they were female-led but here all of the characters driving the plot are male. At the end of this episode, Albert and Gordon mention someone they think can assess the Cooper in South Dakota ("I know where she drinks," Albert mutters); I'd imagine she's Diane, and I'd imagine she's played by Laura Dern. But that discovery remains on the horizon. Another of Lynch's most notable heroines does finally show up in a new role. Naomi Watts plays the wife of Dougie Jones (the credits list her as Janey-E and their son is Sonny Jim; the Jones do like their vowels). She's an effective straight woman to his, or rather quasi-Cooper's, alien-in-a-human-skin shtick. Initially I thought Cooper was just dazed and had trouble speaking but it's increasingly clear that his confusion goes much deeper. Perhaps all of his consciousness did not adequately transfer into its new container. 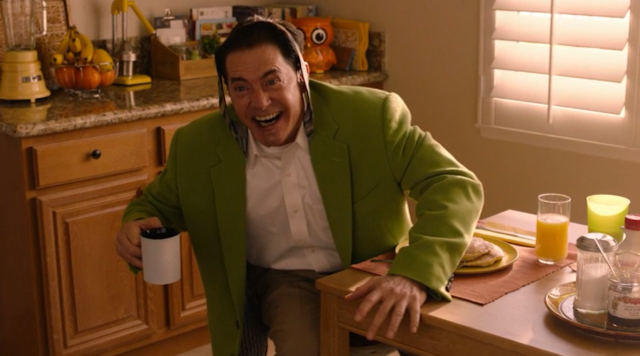 For the record, Kyle MacLachlan has essentially played four characters so far: malevolent, awkward doppelganger Cooper (who seems even less able to function in human society after vomiting toxic garmonbozia in his car accident); easygoing, slightly dopey and apparently not-quite-real Dougie; the Cooper shuffling around in Dougie's body; and the agent who was trapped in the Lodge before he ended up with Dougie. 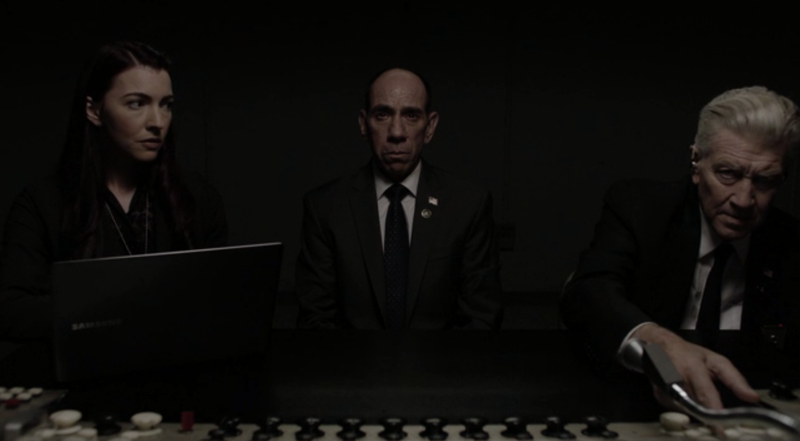 Only the morose, distressed guy in the Lodge (and the other dimensions) is consistent with the Cooper we knew and loved in 1990 and even he has lost his spirit. Much as I love good old Coop, I can wait: these are all marvelous inventions and already MacLachlan should be a frontrunner for an Emmy. One thought occurred to me while watching these intersecting stories. What if Dougie doesn't exist in the same universe as evil Cooper; what if when Cooper was thwarted in his re-entry he was diverted not just to another location, but another dimension? Will Cooper-as-Dougie make his way back to Twin Peaks, only to find a completely different town than we've visited so far? Or, if he does, will that open the question of whether everything we've seen of Twin Peaks in these four episodes is even itself part of a continuous reality? This reminds me of one of the more outlandish theories I dug up on the old alt.twin-peaks forum in 1990, when one viewer suggested (only half-jokingly) that we were not watching scenes in strict continuity but cutting between, say, a universe in which Leo killed Laura and a universe in which he didn't. The conceit seems too elaborate and heady for Lynch's intuitive, ambiguous style, but not necessarily for Frost's penchant for tricky puzzles. As far back as when the new series was announced people have been predicting some sort of interdimensional/alternate-reality arrangement. This may be way too clever by half, but we've reached the point where the series is inviting us to consider such possibilities (much as they will make many "pox-on-TV-predicting!" critics, perhaps justly, grind their teeth). We probably won't have any confirmation either way for several more episodes. Also, look behind Cooper - an owl!